Cadbury Gems occupies a very special place in the hearts of kids; present and past. Its unique shape, size, colours and format instantly set it apart. These tasty, colourful, chocolate buttons have become an integral part of the lives of both children and adults. 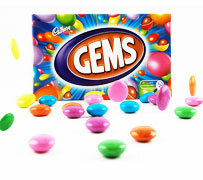 The colourful world of Cadbury Gems has six colours – Red, Green, Pink, Yellow, Orange and Blue.